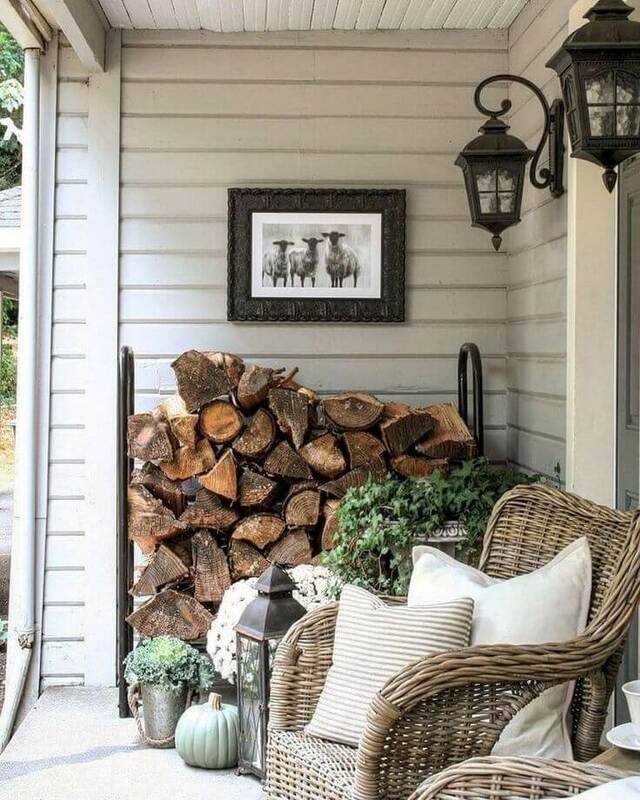 Farmhouse outdoor decor never goes out of style. There’s just something so charming about the slow days of farm life that helps us relax, enjoy every minute and recall simpler days of the past. Bring that same aesthetic to your front and back porch with a style that uses vintage pieces and aged wood for a creative, peaceful look. They’re a timeless, simple decor choice that helps your front porch look sophisticated but never pretentious. 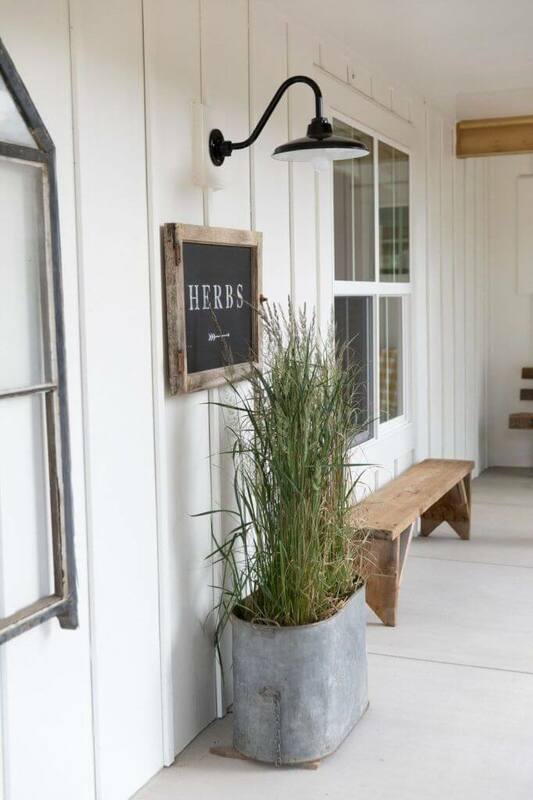 Staples for farmhouse outdoor decor ideas include aluminum pots and wooden boxes. These create beautiful planting spaces for your herbs or vases for cut and dried flowers. Other staples include distressed wood (even better if it’s natural) and burlap. Iron lantern style lights also fit the bill. If you have a fireplace, you can even use wood storage to create accent walls. Everything ties together because it’s natural materials mixed with simple metals. No loud colors or eclectic patterns. Once you get your decor ideas in place, all you need is the perfect glass of sweet tea (or hot tea if that’s more your style) and a reason to invite friends and family over (watching the sunset works nicely) to talk and reminisce all evening. 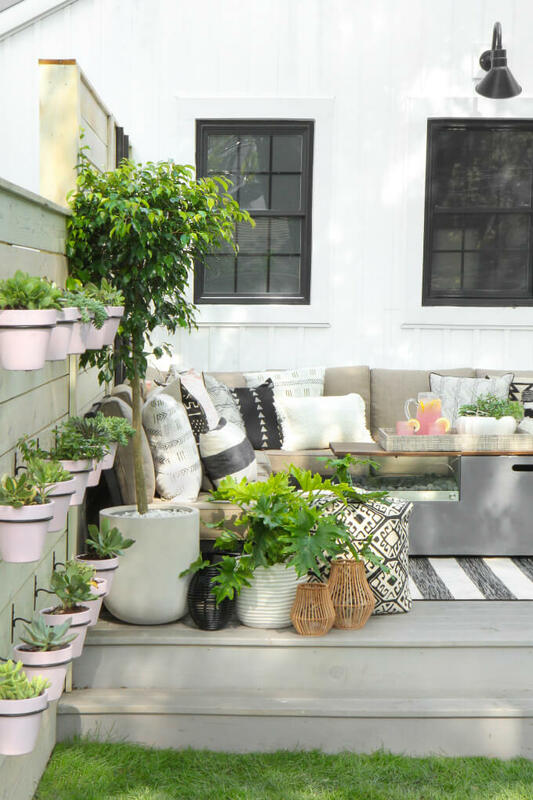 We’ve compiled a list of our nine favorite farmhouse outdoor decor ideas so you can find inspiration for your perfect front or back porch. Let’s take a look! Our first idea is a farmhouse staple: the woodpile. If you have a fireplace (and we’re jealous), use the empty space near your front door or along a taller wall on the porch to stack wood between minimal iron railing. Use natural wicker furniture and iron lantern style lights for a sophisticated take on farmhouse decor. You can plant in just about anything. 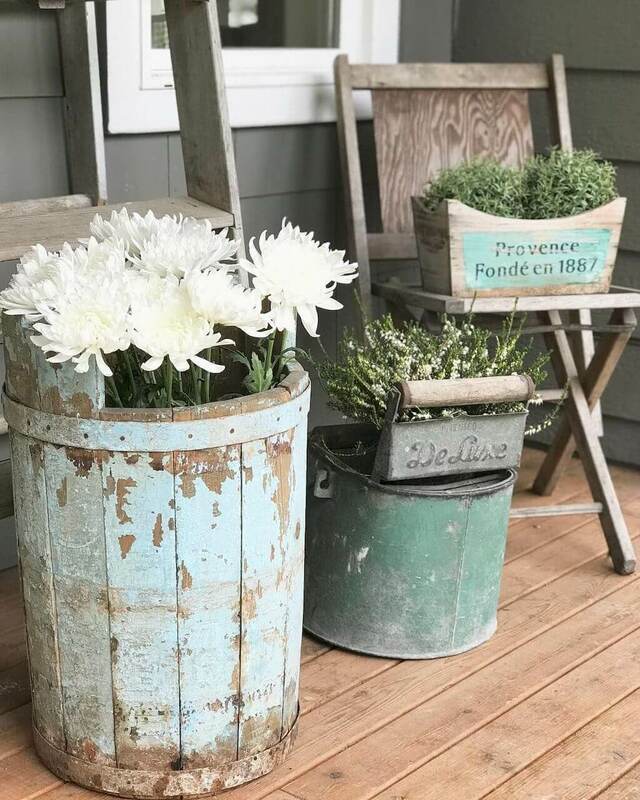 Use these vintage items for a place to grow herbs and flowers on your front porch space. A washing pail and a wooden vegetable box with French accents make great homes for herbs. Plant tall flowers in a tall bucket, so they peak out the top for a cut flower look that doesn’t fade. 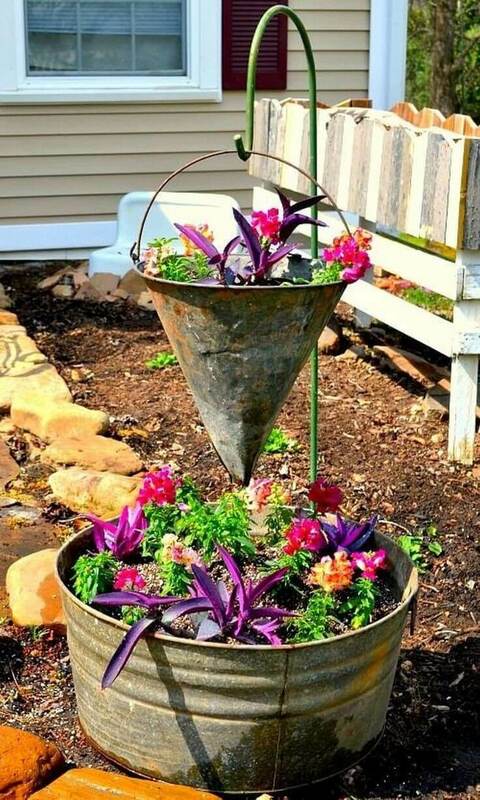 Vintage aluminum pieces like funnels and pails are great for creating these unique planters. Use one round planter on the bottom for a large flower pot. Find a stake made for hanging pots or bird feeders at your local garden center and use it to hang a separate aluminum piece with a handle. Plant flowers in both. Enjoy all summer. Old milk pails, pitchers, and crocks look fantastic sitting outside as accent pieces for your side tables and shelves. Put dried flowers in a pitcher on the table with a candle for a sweet look. If you have siding or shiplap, it’s even better. 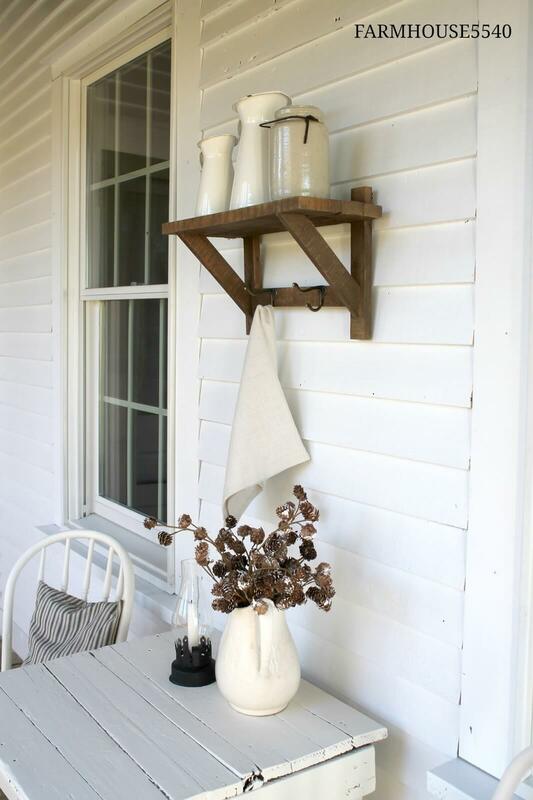 Keep everything a clean, but aged white for the most classic Farmhouse feel of all. Shutters take a lot of wear. 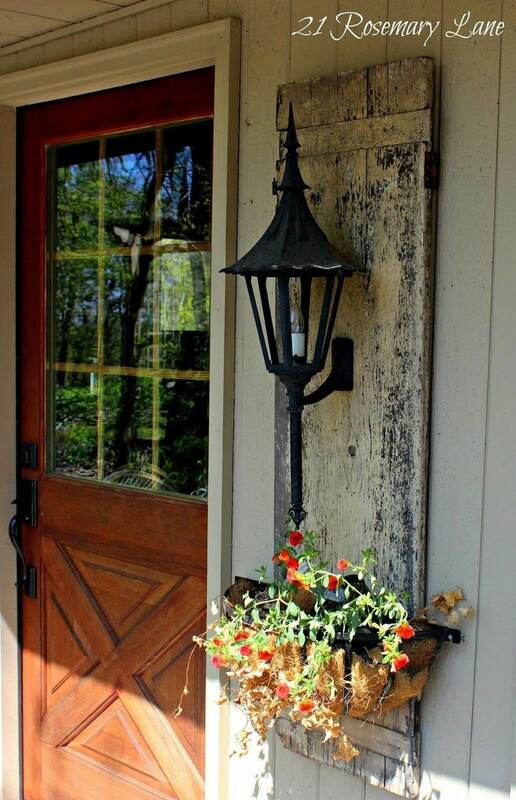 At the end of their lives, use their weather-beaten style to create a backdrop for an iron lantern style outdoor light and a hanging planter underneath. Use the planter for your flowers or herbs and make sure to match the iron accent of the planter to your outdoor light to keep everything coordinating. Like shutters, outdoor screens age beautifully. This one became a picture frame with string in the middle so you can clip art to it as you like. Below, a luxe couch gets a Farmhouse treatment with simple gray burlap pillows and skirt. Ribbons on top of the pillow closures complete the look. 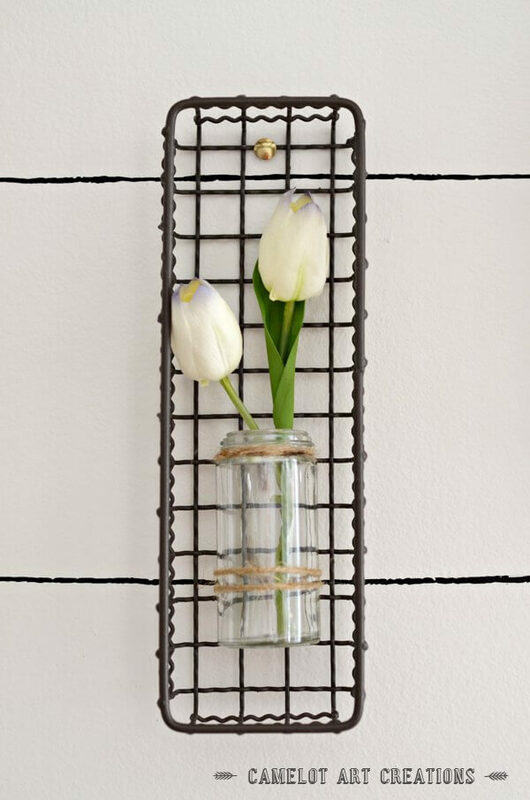 Small iron baskets make great backdrops for wall decor. This one uses a simple wire frame and a glass jar to create a hanging planter. Use twine as a decorative accent for the jar. These pieces are easy to hang because the wire frame makes it easy to see the screw or nail in the wall, so you could make and hang a bunch in no time. This entire seating area just begs for sweet tea and long evening conversations. It uses a wraparound couch as an anchor and plenty of plant life for a lush, green style. Painted gray steps add a touch of sophistication and a full wall of hanging pots completes the design. Finish it off with a potted tree and an iron light above. 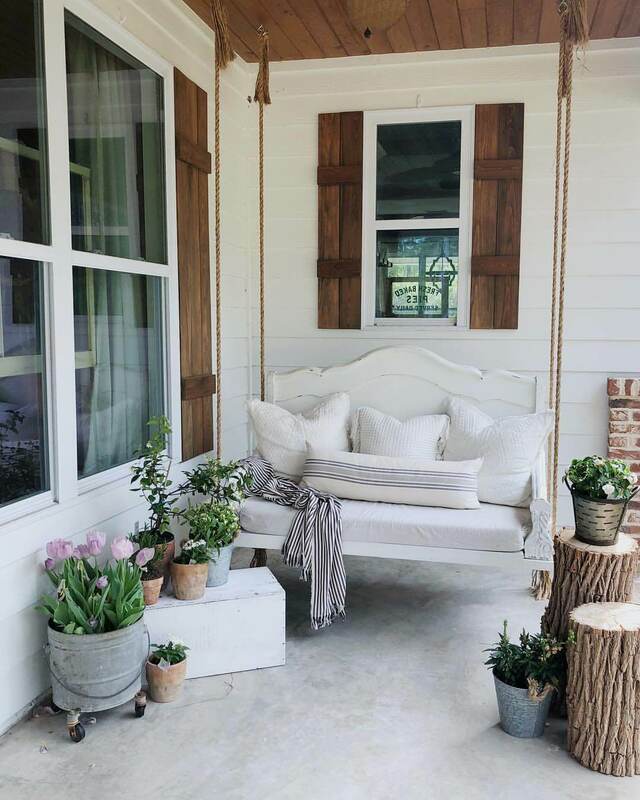 This small porch swing gets a Farmhouse makeover with rope and sweet white cushions. Use vintage aluminum accent pieces and pieces of cut wood to hold your other decor. Rolling aluminum pots look great with perky tulips, and smaller pots can hold herbs and other bits of greenery. It will smell lovely while the slow rocking relaxes you. Have you ever been strolling through an antique store and been struck by the beauty of an old headboard? The ornate designs in the wood draw you in, but what would you ever do with it? 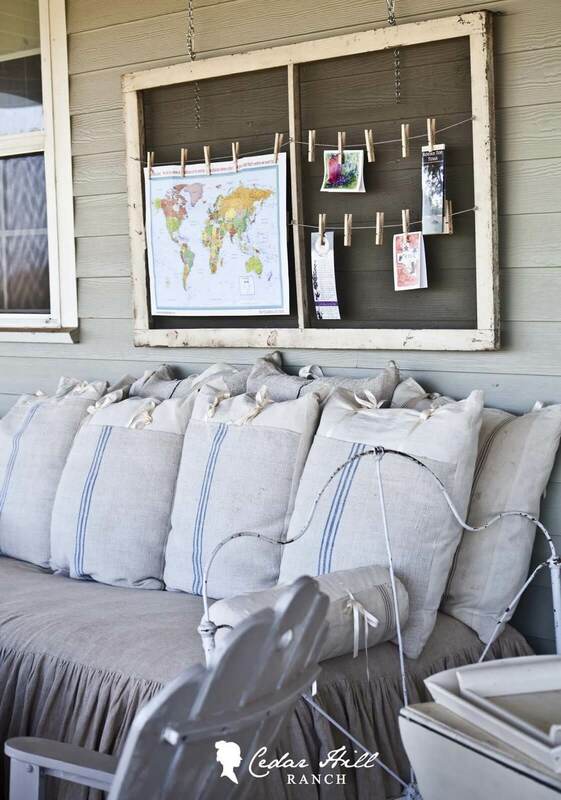 This DIY lets you transform a vintage headboard into a pretty new bench for your porch. 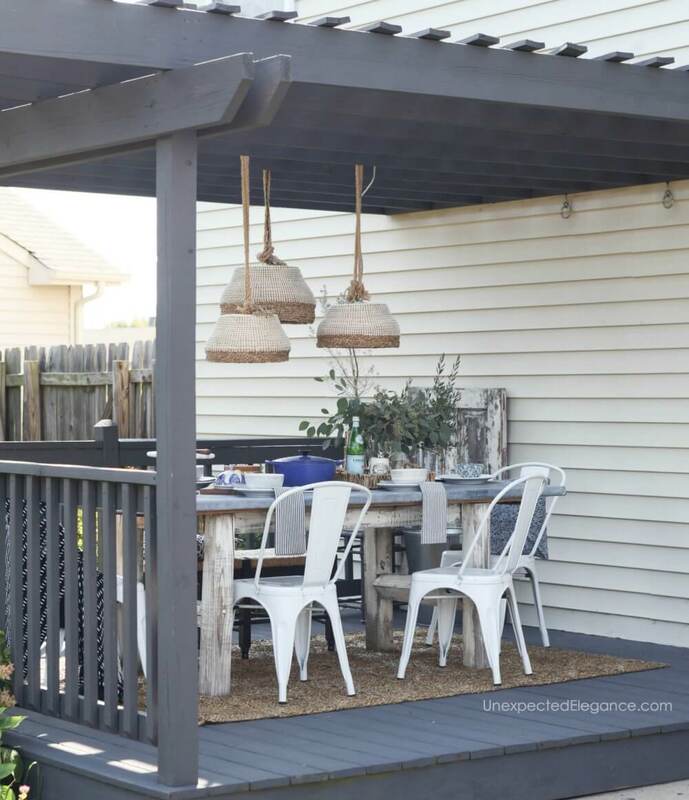 Want to add some better lighting to your outdoor entertaining space? Then this project is perfect for you. With just some everyday woven baskets and light kits, you can make your own pendant light fixtures. They are fast and easy to make and will be the envy of the neighborhood! 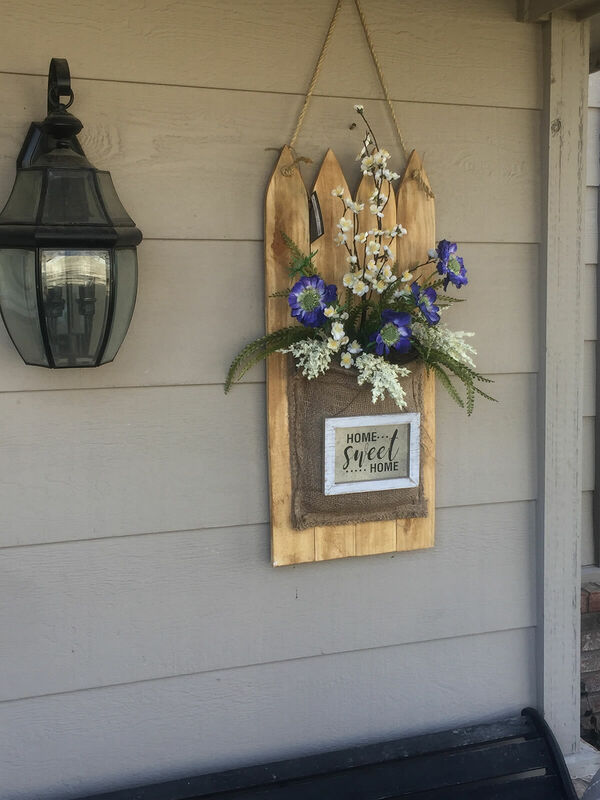 Hanging a pretty sign on your front door or porch is a fun way to welcome guests to your home. This sign features a pouch where you can display seasonal blooms and plants all year long! The cute picket fence shape instantly gives your outdoor space an inviting, homey feeling. 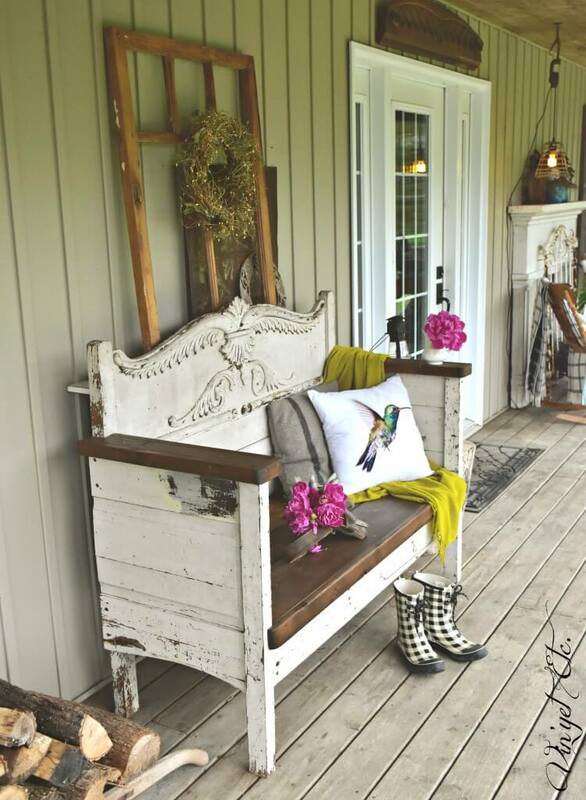 To give the outside of your home as much farmhouse charm as the inside, decorating your porch is key. This porch display uses a galvanized metal watering trough as a mini garden to add both a rustic touch and a fresh element. The chalkboard farm stand sign above finishes the look! 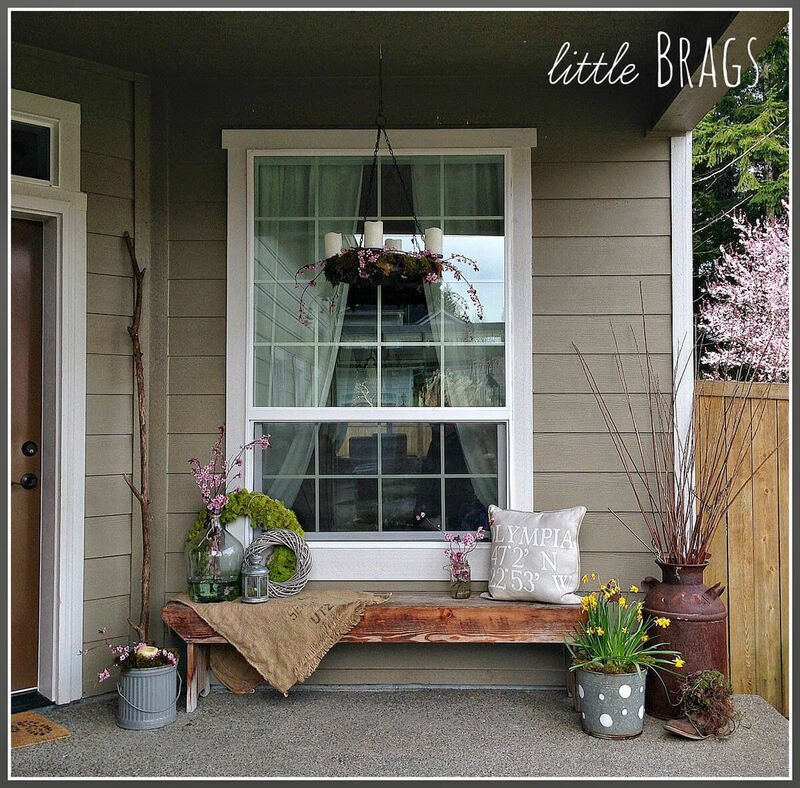 If you’re looking for some springtime porch inpspiration, this display is for you. Fresh flowers and moss show the new growth of spring while the wood and metal elements really bring that traditional farmhouse vibe. The hanging candle chandelier is the star of this show, though! This DIY is a lesson in gorgeous contrasts. 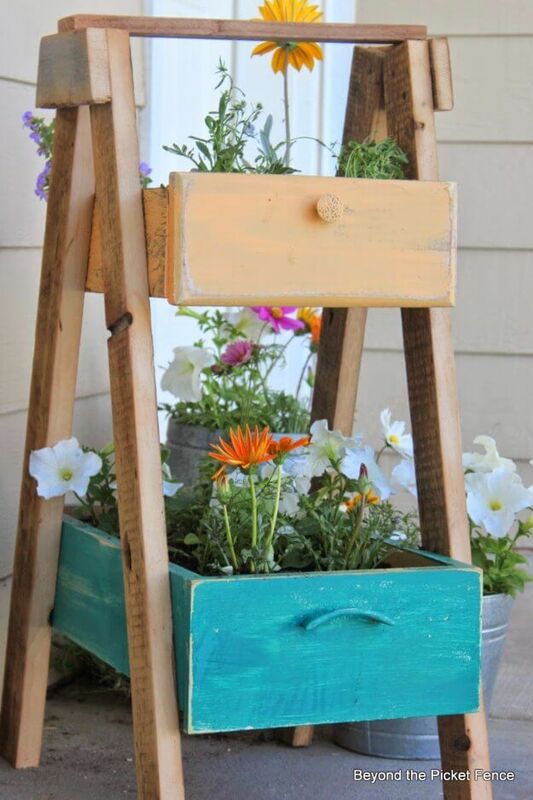 Bring some color and personality to your outdoor space with this cute DIY planter. With just a few pieces of scrap wood and two wooden drawers that need a little love, you can make this sunny project. It’s the perfect way to grow some flowers or herbs if you don’t have much garden space. Whether you are preparing for a party or just want to enjoy your outdoor space more, a little extra lighting creates a cozy glow. 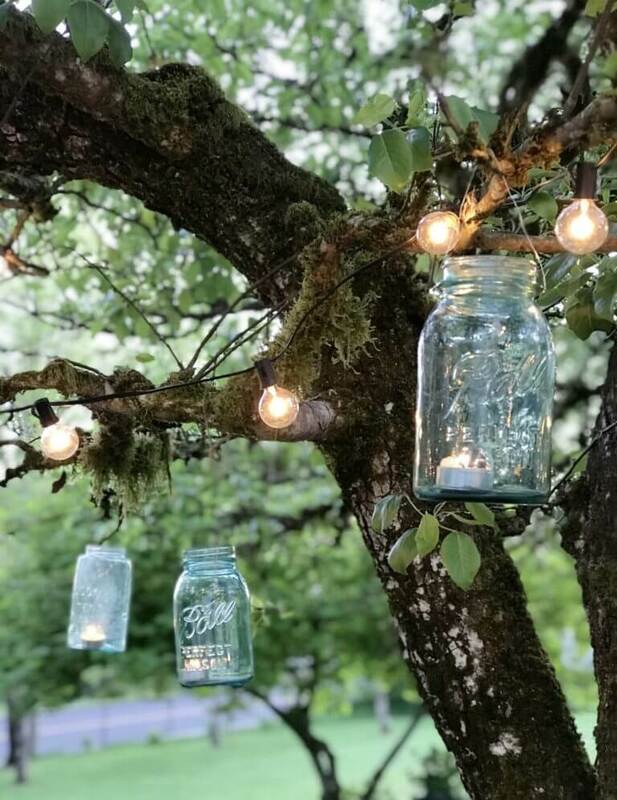 To make these lanterns, all you need are some tealight candles and glass mason jars. Hang the lanterns from tree boughs using sturdy wire to make your yard feel more inviting. 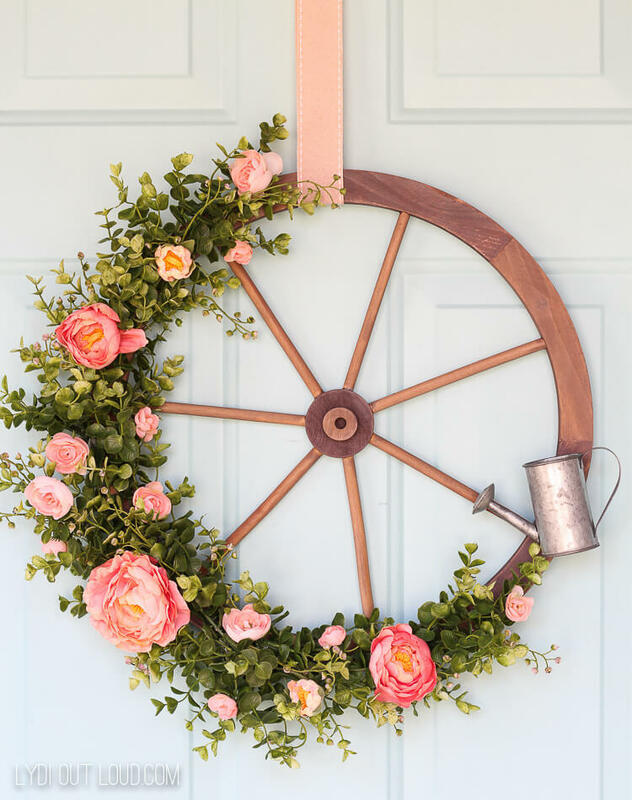 Give your home a touch of spring blooms with this pretty “wreath.” By using faux flowers, you can be sure that this DIY will hold up the entire season! The contrast between the rustic wooden wagon wheel and the pink blossoms provides visual interest and the perfect warm farmhouse feel.